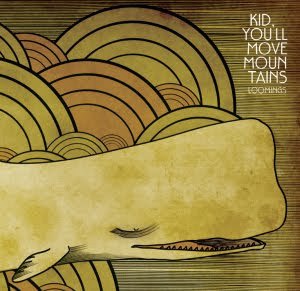 Since releasing their debut record, Loomings, less than one year ago, Chicago five-piece Kid, You'll Move Mountains have unquestionably made their mark on the local scene, scoring an impressive amount of press and a number of high profile gigs. Take, for example, their write-up in Filter's Ragged Magazine, or Metromix Chicago recently choosing Loomings as one of of the top 10 albums of 2009 so far. On Friday, September 11 the band will play Subterranean with another standout Chicago act, Mr. Russia (more info and tix here). It's not often that an indie band with just one record to its name gets so much attention so fast. Lots of musicians, although talented, have a tough time getting people to take notice. What's KYMM's secret? I don’t think there is one. I really can’t explain it. We appreciate every chance someone gets to hear us immensely but we’re not a really well-connected band or anything. We do the normal things that every band does to get word out, but every bit of press or every amazing slot we’ve gotten for a show is a complete shock. We never expect anything. We just do what we can and let the cards fall where they fall. There’s so much music out there and so many different ways to hear it that if someone manages to find us and like what we’re doing, that’s astounding to me. KYMM has ties to a few other area bands. For those not up to speed on the history, tell us about these bands and a bit on how KYMM came to be. I lived in Milwaukee from birth until my late 20’s and around 2003 or so, I had gone to see my friend’s band play at a venue called the Globe East, which is no longer there. It was a label showcase for Latest Flame, which is now based in Chicago, and one of the other bands on the bill was Troubled Hubble. I hadn’t heard them before and they were super energetic and humble and their songs were fantastic. So I struck up a friendship with those guys and eventually, bands that I was in went on to play with them a lot. They eventually signed to Lookout! Records too and toured the country a ton but they eventually broke up in September of 2005 and I think the following spring, Nate and Andrew (Lanthrum; drums and bass respectively) from Hubble and I had toyed around with playing together. I had met Corey (Wills; guitar) from Inspector Owl through them and Nate’s wife Nina (Lanthrum; vocals/keyboard) as well and we just started writing together. For about a year, I was commuting almost every weekend from Milwaukee to the western Chicago burbs for shows and practice, so I moved down officially in the summer of 2007. What have you guys thought about the response to Loomings so far? Since it came out I've been reading almost exclusively positive reviews in a long list of places - from the Sun-Times to the Chicago Reader, with it most recently being included in Metromix Chicago's "Top 10 albums of 2009 so far". After you finished the album did you know you had a good thing on your hands, has it come as a surprise? We knew we were all proud of it, but getting a thumbs-up from someone like Jim DeRogatis or getting to play Taste of Chicago or the Metromix thing or the Ragged promotion were all out of nowhere. To us, or any band with a record that’s been out for a while and songs that have been played for a few years beforehand, the songs are kind of standard now so for new people to hear them for the first time and react so positively kind of makes me go back and appreciate some of the dymanics or recording/mixing choices again. We did have a few not-so-hot reviews on some blogs, mainly trashing the vocals, which I can understand. Whenever a review would come back and it would slam Nina or I, or praise the rhythm section, Nate always replied jokingly to us in the band via email with something like “Score another one for the Lanthrum brothers!”. 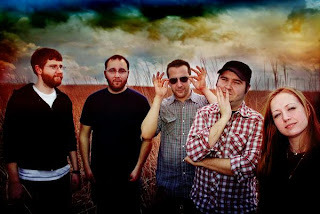 The band's sound is pretty hard to describe and pin down into specific genres outside of a generic "indie pop/rock" tag. Is that by design? I’m comfortable with us falling under that tag. We definitely take it as a compliment if someone says that they can’t pigeonhole precisely. We don’t try to be overly weird or anything; we just want the songs to be memorable but maybe to have one or two hiccups thrown in so it doesn’t get boring, whether we’re playing it for the first time or the thousandth. I think making the songs super complicated and confounding can be just as off-putting as making them overly basic. I think both ideas can hold hands and play nice and compliment each other. I read that you've been working on new songs this summer. How are they coming along? Is the material continuing down the same path that we heard on Loomings? We’re debuting a new one this upcoming weekend for sure and others are very close to being done, so those will come soon too. I think these newer ones sound a bit different than the record in varying ways. On one end, the one we’re ready to play is both the most funky and most metal we’ve gotten. Well, funky and metal for our band, at least, which isn’t saying much obviously. It’s just dancey and kind of chaotic towards the end. But then there’s another that I think is pretty reserved and clean throughout. It kind of gradually simmers more so than anything else we’ve done which is nice. I’d like to think we do certain things well but we just can’t do them all the time, otherwise it gets boring for us and anyone who’d hear it. So I think these next ones coming up aren’t too far out there, while still differentiating themselves from the record. You released Loomings independently, but after the positive response is there any interest in working with a label in the future? We’d love to, definitely, but we’re realistic. We know that because we all have full-time jobs and we don’t tour five months out of the year, right off the bat, a label might look at our resume and go “Well, they’ve barely gotten out of the Midwest. No thanks.” But I think that the stuff we have done with the little time we have works in our favor. Certainly if some musical genie were to say, “We’ll pay your rent for a bit if you go out and open for so-and-so,” we’d be all for it. But we’re not sweating ourselves sending out to labels right now. I think we know what we’re doing for now but would never scoff at any help. KYMM has played with quite a few bands at quite a few different places so far. Do any stand out as favorites or the most memorable? If so, why? Shows with Maritime are always great. I spent most of my late high-school/early college days being obsessed with the Promise Ring, so it’s absolutely ridiculous to me that Davey (vonBohlen) and Dan (Didier) are pals of ours now. But headlining the Metro has to be the most thrilling experience for me thus far. Corey, Nate and Andrew from our band had all played there before, but it was brand new to me and having seen so many shows there growing up, it was overwhelming to not only play there, but to headline for our CD release and have so many people show up and have our friends Picture Books open. I really don’t know how bigger bands just get used to that sort of thing. Every awesome opportunity like that, to me, is something I’d never take for granted. I still can’t believe so many people either promoted it in Chicago media or just came out or wanted to even book it in the first place. What can we expect from KYMM for the rest of the year and into next? Hopefully just lots of new songs continuing to hit the road. Although the record came out this year, some of these songs are almost three years old, so we just want to expand on what we’ve already done and perfect it more. I’d like to think we’ve just scratched the surface of what we can do songwriting-wise. I’m super happy with what we’ve done and what we’re doing, but I think we all see the potential to push ourselves a lot further.